I could finish my review here, but maybe that would short change the production just a little, so I will ramble on a while. Remember the TV episode Time Heist? 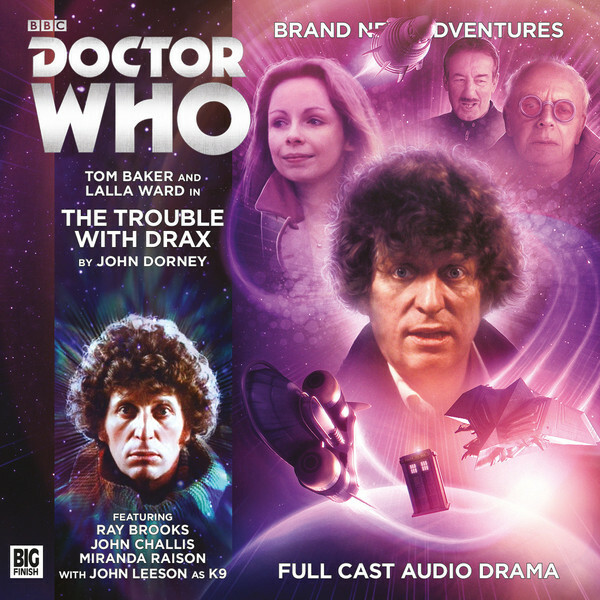 Well this story is almost completely unlike that one apart from the fact it contains a bank robbery, a robbery carried out by The Doctor under the supervision of his old friend (now in his third regeneration) Drax (Ray Brooks). Long time fans will remember Drax from the TV story The Armageddon Factor – hardly the crowning glory of the Williams era, but Drax was a fab character, played on TV by the late Barry Jackson – a mock cockney small time crook, a renegade (with a distinctly small “r”) Time Lord who was a school contemporary of the Doctor. It turns out that Drax installed a recall device in the Doctor’s TARDIS at some point during that story, and now he is in a bit of trouble with villain (or legitimate businessman) Charles Kirkland (Hugh Fraser) and has recalled the Doctor, Romana & K9 to help him out. Drax being a crook has come into the possession of a map that leads to the fabled city of Altrazar – a sort of temporal Atlantis, an oubliette in time where the rich and powerful hide away their secrets, he has also got himself involved with the previously mentioned Charles Kirkland and his servant Rosser (John Challis) and has been cajoled in to going to Altrazar to retrieve the secrets of Kirkland’s rival Grunthar (John Banks) and so with Romana under guard on Kirkland’s ship, Drax, Rosser & the Doctor head to Altrazar – and then things get very very complicated….. This story is a riot, a romp, a hoot – brilliantly put together and very very funny (but not necessarily in that order) it has twists on twists and crosses on double crosses but unlike a lot of TV Who it makes perfect logical sense. Lets look at the cast – when you are cast in a season 17 story you don’t underplay and all the actors are relishing their roles, from the suave Kirkland, to the gruff Rosser, to the chirpy cockney charmer Drax to the dour Inspector Fleur McCormick (Miranda Raison) each have their entrances and exits, and each in their time play many parts (to misquote Shakespeare) – put it this way, what could be a dull “timey-wimey” story about a bank robbery becomes a thing of joy, beauty and fun due to the wonderful synchronicity of the cast, the writer and the director – everything just works and the final payoff will have you taking your virtual hats off tho not only the writer but the ingenuity of the characters. And thats your lot, any more would be far too spoilery. There are some actors that just gel together – Tom, John Challis and Ray Brooks are a fab triple act and I genuinely hope that The Doctor & Romana cross paths with Drax and co again very soon, because you can never have too many apparently inept time lord renegades (small “r”) in a season 17 pastiche. A classic. 10/10. This title was release in June 2016. It will be exclusively available to purchase from the BF website until July 31st 2016, and on general sale after this date. When the TARDIS is dragged out of the space-time vortex, its crew aren’t best pleased to see the Doctor’s old school friend, even less when he pressgangs them into joining a raid on the most secure safe-house in history. However with Romana and K9 held hostage, the Doctor has little choice but to agree. With Drax in tow, he heads for the planet.